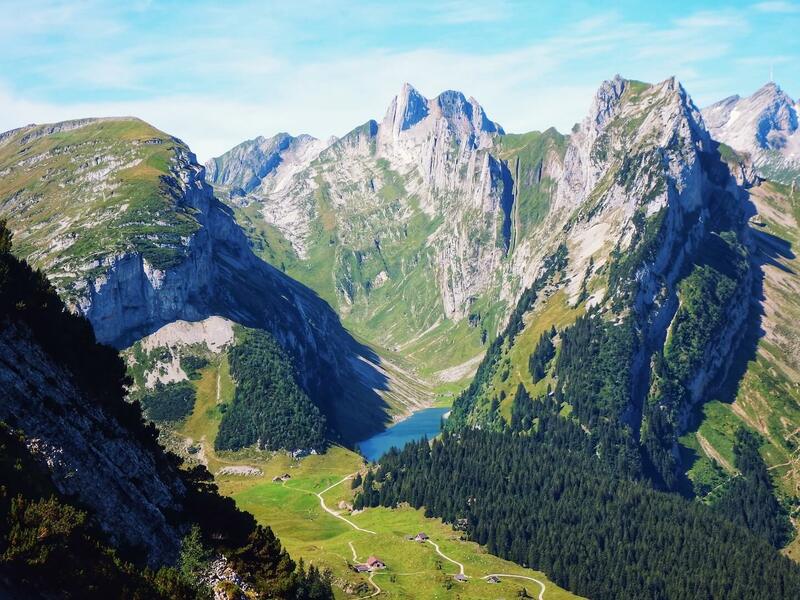 Appenzell (aka Appenzellerland) is a region in north-eastern Switzerland that is divided into two sub-cantons: Appenzell Ausserrhoden and Appenzell Innerrhoden. This beautiful corner of Switzerland embodies pastoral romanticism. Farms are situated on hilly green pastures framed by pockets of forest. As you take in the idyllic landscape dotted with grazing horned Braunvieh cattle, you might think that you’ve landed in the happiest place on earth. The Alpstein mountain range forms the backdrop of the Appenzell region. 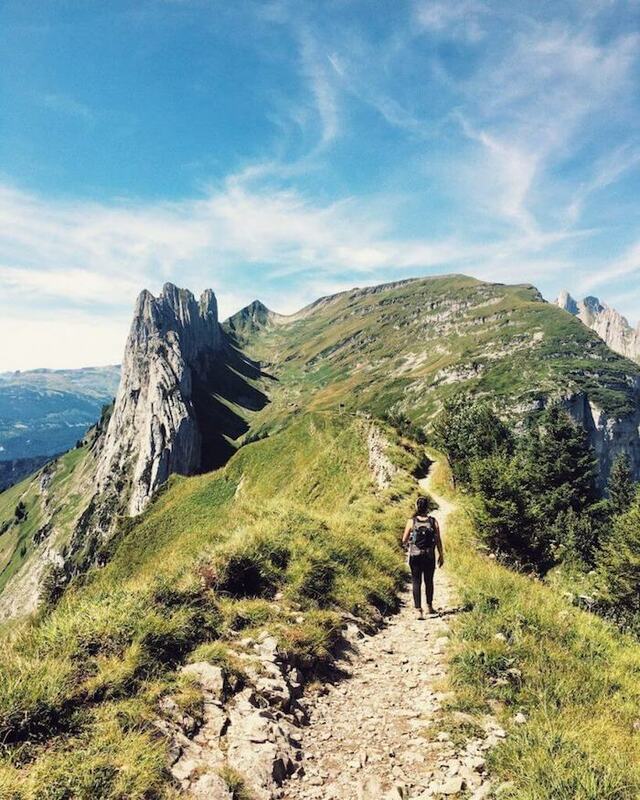 Hiking in the Alpstein is magnificent and surprisingly very accessible. Most day-hikes begin or end with a Seilbahn (aerial cableway). As you’re hiking, you’ll be accompanied by the cheerful bell ensemble of the alpine cows and goats. 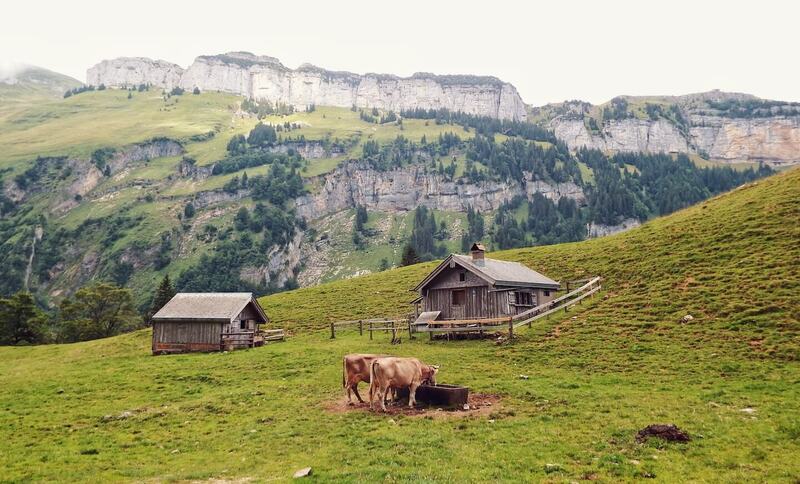 Perhaps the most satisfying aspect of hiking here is that you can purchase Appenzeller cheese directly from farmers. 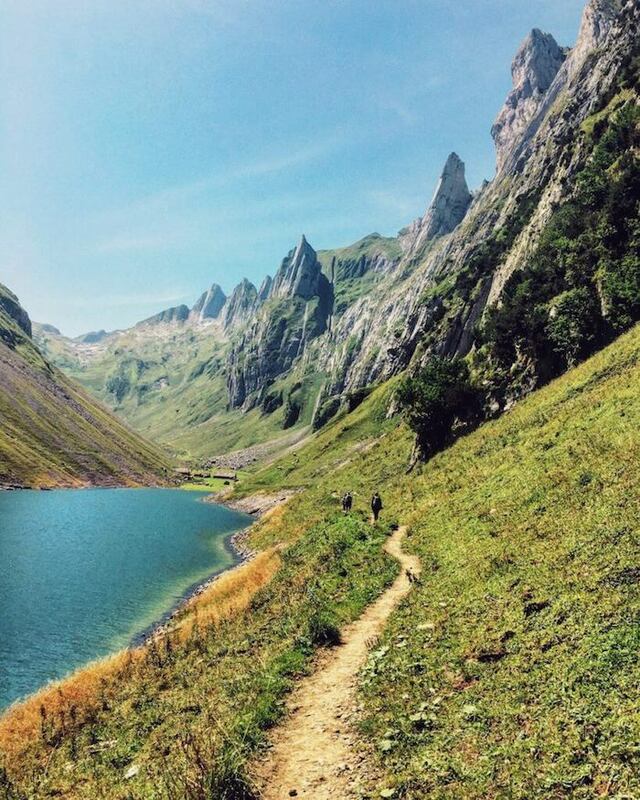 So, in our book, Appenzell is one of the best places in the world to hike. If you’re driving in Switzerland and intend on taking the highways (Autobahnen), make sure to buy a “Swiss motorway sticker” or “vignette” for 40 CHF (approx. 41 USD). It is valid for the whole year. Unlike Austria, there are no 10 day or shorter period options. In Switzerland, the “vignette” can be purchased in petrol stations, post offices, garages, TCS outlets, as well as from the road traffic authorities. Mid-Range | Guesthouse Forrenhüsli is a rustic and quaint house in Appenzell. From the guesthouse, it’s a 5-minute drive to reach the historic center of Appenzell. The guesthouse can only accommodate a few people, as there are only 2 small guest rooms. Luxury | Hotel Adler is located directly in the historical town of Appenzell. Breakfast is included in the room rate. Also, look for accommodation in Gais. 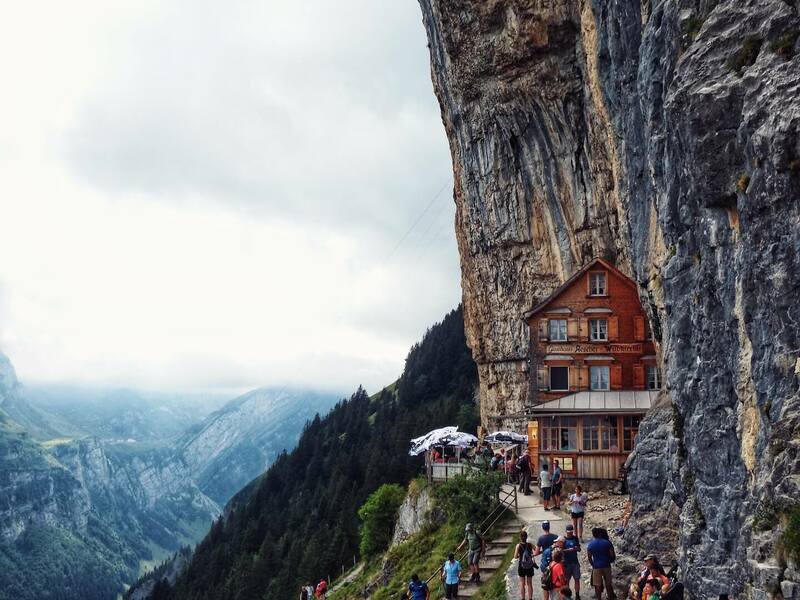 If you want to stay directly on the mountain, check out the mountain inns (Berggasthaus) in the Appenzell region. This Swiss region is very rich in its traditions. The procession of cattle to alpine pastures takes place every year from mid-May to June. Alpine herdsmen, clad in traditional costumes, and carrying a milking pail (Fahreimer), lead the bell cows up to the alp for the summer. Side note: the single long golden earring – shaped as a snake – that the men wear in one ear is an ancient symbol of fertility and a protection against snake bites. During the ascent, the herdsmen sing and yodel. From mid-August to end of September, the descent takes place in a similar fashion. We visited in early August, which was perfect for hiking. Serendipitously, the Folk Music Festival was taking place in the town of Appenzell during our visit. 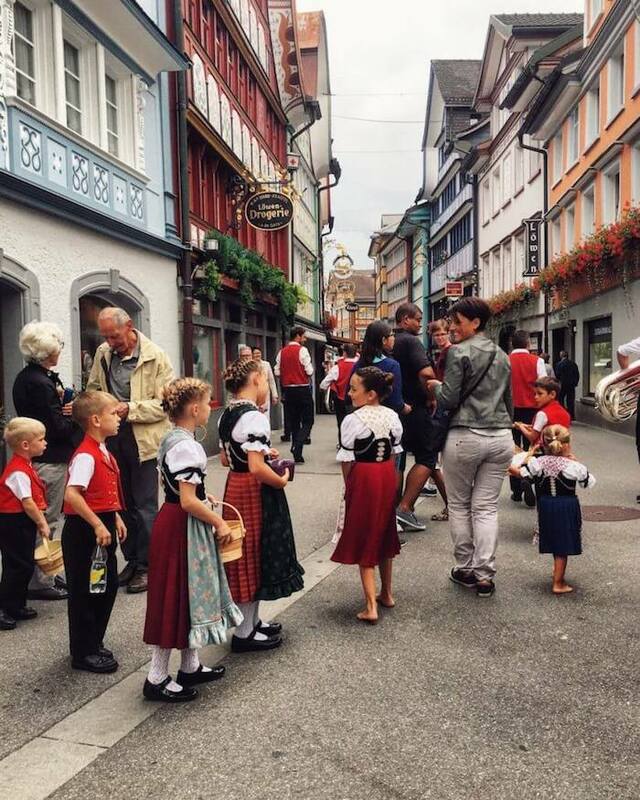 Music is an important way in which the Appenzeller people uphold their cultural heritage. We were able to hear traditional music, like multi-voice yodeling, and see locals clad in their vibrant traditional attire. December 31st & January 13th: New Year’s Mummers (Silvesterkläuse) – Dressed in grandiose costumes, the Silversterkläuse process from one farm to another ringing cowbells and performing a Zäuerli, which is a traditional wordless natural yodel. Maundy Thursday (Thursday before Easter) – Ash Wednesday: Carnival. in Appenzell, Carnival is celebrated with Ommetronmmere (drumming) and with the Botzerössli (hobby horses and riders). The wooden hobby horse procession mainly takes place on Saturday. Fourth Sunday in Lent (March) – Bonfire Sunday has its roots in pagan ceremonies that were designed to drive away the winter and exhilarate the fertility of the fields. June-August – Alpine Festivities, hosted by herdsmen, take place on various alps and in mountain inns. It’s very easy to romanticize this region as a visitor. 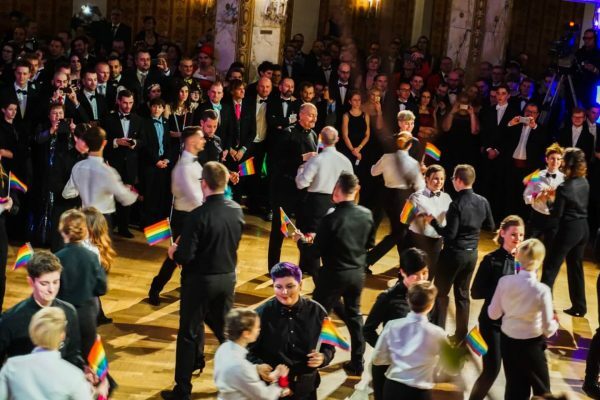 However, living in a traditional society has its challenges and downsides too. The women of Switzerland didn’t earn the right to vote until 1970 (very late by European standards). But, the women of Appenzell Innerrhoden weren’t granted the right until 1990 (cringe). 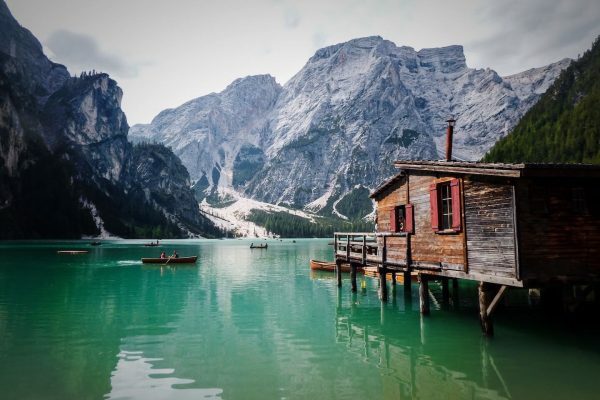 Seealpsee is a beautiful alpine lake in the Alpstein. You can reach the lake from Wasserauen in about 1 hour and 30 minutes. We opted for the dirt trail (off to the left) instead of the paved path. The trail begins steeply and ultimately plateaus in a picturesque alpine pasture. On our way to the lake, we checked out a dairy farm and admired the horned cattle proudly walking about and wearing their bells. After encircling the peaceful Seealpsee, we ascended the steep trail to the mountain inn Äscher (1 hour), where we had a hearty lunch. Next, we hiked 20 minutes to the Ebenalp Seilbahn, to catch the next Cableway down to the parking area. Parking: There’s ample paid parking space (3 Francs in 2017) in Wasserauen. Experience Level: Intermediate. On a technical level, it’s not difficult. But, it’s strenuous, because of the altitude gain. The trail is well maintained and clearly signed. 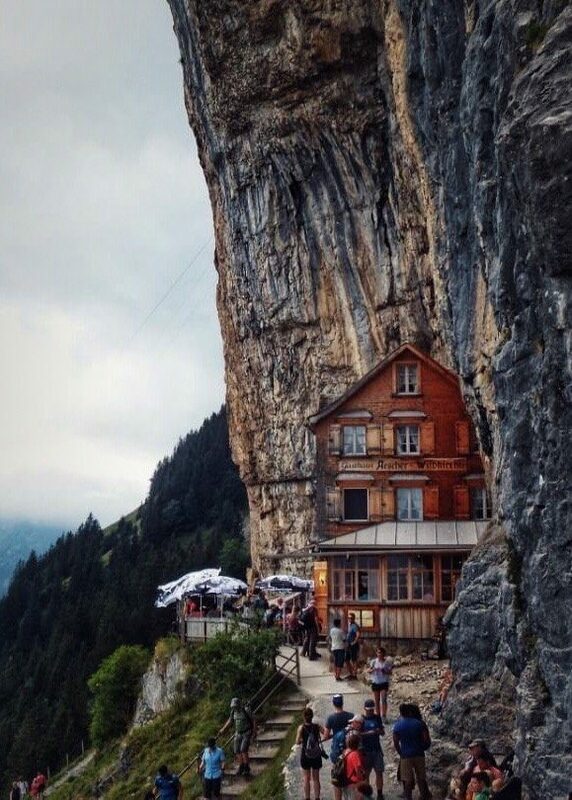 Built into the side of the mountain, Berggasthaus Äscher is one of those places that romances you at first sight. This photogenic mountain guesthouse is a rewarding place to eat lunch after a strenuous hike. We devoured our Rösti (regional potato specialty: hashbrowns) and Appenzeller Käse (regional cheese) with great pleasure, and likely we’d have ordered more if we didn’t have to hike uphill. We were also astounded about how fast and kind the service was despite the number of people. You can reach this mountain inn by hiking from Seealpsee (see experience above), or by taking the Ebenalp Cableway up to the summit of the mountain and hiking down to Äscher (20 minutes). Äscher is also closely located to the Wildkirchli Caves, which contain a cave chapel (1621) and a Hermit’s House, originally built in 1658 and reconstructed in 1972. Herdmen and hermits began selling food and drink here as early as 1800. The caves also were used in the Palaeolithic Era (45,000 to 30,000 BC) by hunters and gatherers. In the early 20th century, archeologists found prehistoric stone tools and the remains of about 800 animals. Reservations: They don’t accept reservations. 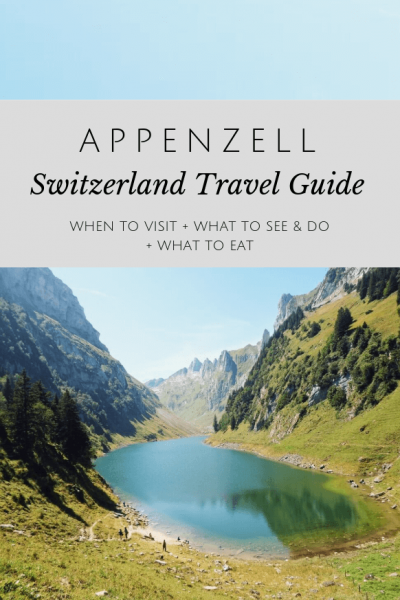 If the hiking hasn’t convinced you to come to Appenzellerland, then the cheese might. Appenzeller cheese is known for being kräftig (bold) and würzig (spicy). The unique flavor of the cheese is attributed to the quality of the milk as well as the herbal brine recipe, which is composed of a variety of herbs, roots, leaves, and flowers. The cheese is made from fresh milk of alpine cows that only feed on grass, hay and maize plants. 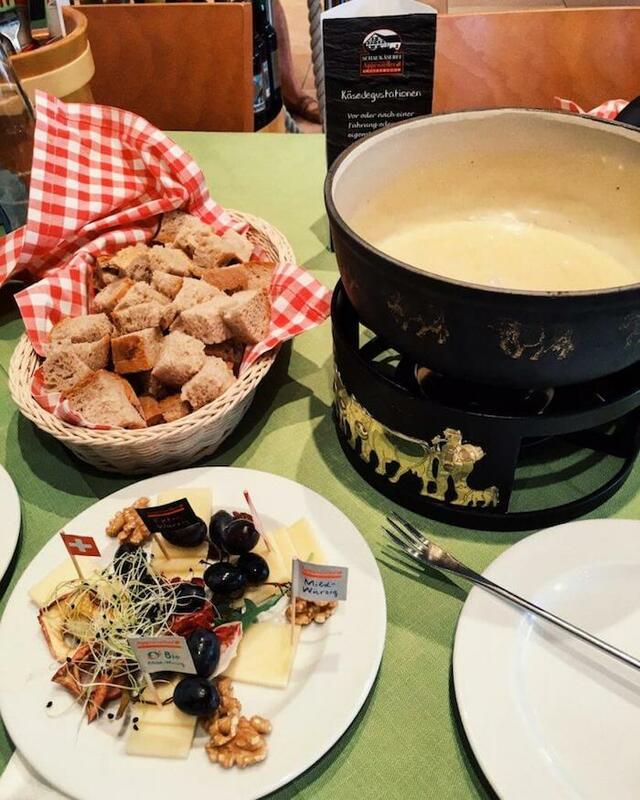 A great place to understand the Appenzeller cheesemaking process is at the Appenzeller Show Cheese Dairy in Stein. You can observe every step of the process and learn about how cheese-making and tradition are synonymous. Connected to the showroom is a shop and a restaurant. We sampled a platter of cheese and their fondue made with white wine and cherry schnapps. The hike begins at the Hoher Kasten tram station, at the summit of the mountain (elevation 1,795 meters). You can park in Brülisau and take the cableway up. From here, you’ll have an incredible panoramic view of the Rhine Valley, Appenzellerland, Lake Constance and surrounding mountain ranges. The trail leads you downhill in the direction of the mountain guesthouse Berggasthaus Stauberen. Off to the right, you’ll see the lakes Sämtisersee and later Fählensee. As the trail approaches Saxer Lücke, you’ll have exceptional views of the mountain Kreuzberge. The name Saxer Lücke (Lücke means gap in German) originated in the Middle Ages. 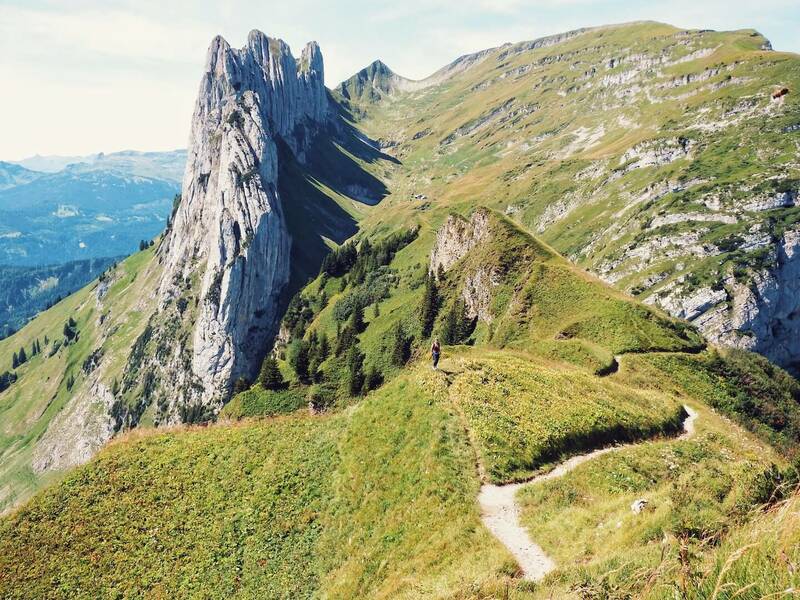 At that time, people could cross the mountain more easily from the Rhine Valley to Appenzell and St. Gallen, because of the gap in the mountain. From the gap, you’ll descend 30 minutes to Bollenwees on the lake Fählensee. Bollenwees is a mountain guesthouse and restaurant. Definitely eat lunch here. 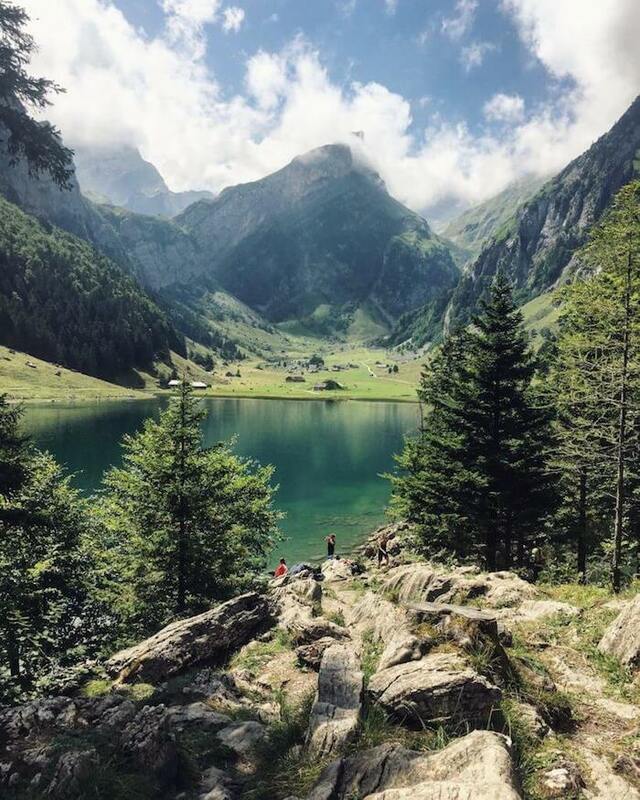 Before you even think about leaving Fählensee, make sure to hike alongside the lake to the other end. At the opposite side of the lake, there’s an enchanting goat farm, which you probably won’t want to leave. From the lake, it’s a 2 hour descent to Brülisau, your starting place. Trail Name: Erster Geologischer Wanderweg der Schweiz. “Geological Trail”. There are info-boards explaining the geology of the region along the trail. However, the text is only written in German. Experience Level: Intermediate. The trail is mostly downhill, which is tough on the knees (especially the last leg of the trail). Fählensee (also spelled Fälensee) is an alpine lake in the Alpstein mountain range. The mountain Inn Bollenwees is located on one end of the lake. On the other end, there’s a dairy farm. This is truly one of the most serene and dreamy places on earth. The best way to experience the lake is by eating lunch at Bollenwees and walking along the lake to the farm. We stayed at the farm for an hour, watching the white Appenzeller goats return home. We chose a large rock to sit on to watch the procession. One of the friendly goats decided to join us on the rock. 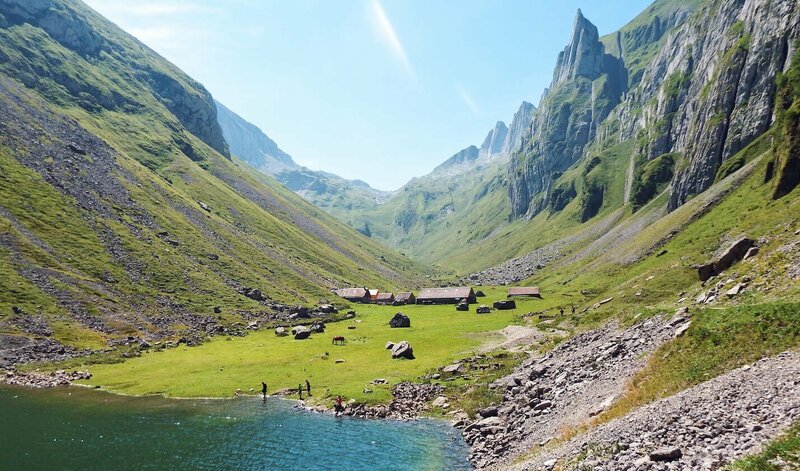 To reach this lake, follow the geological trail from Hoher Kasten (see experience above), or hike 2 – 2 ½ hours from Brülisau. Appenzell is a quaint town of 7,000 inhabitants in Switzerland’s Canton Appenzell Innerrhoden. It’s the cultural and political center of the region. 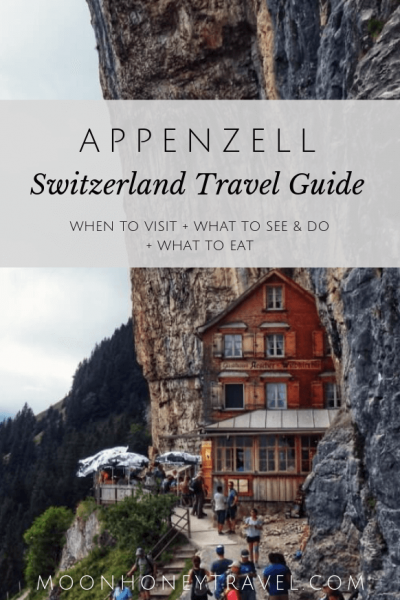 When you’re in Appenzellerland, it feels like all roads lead to Appenzell, especially when you’re hungry. What strikes you at first are the colorfully painted facades and curved gables of the wooden houses. Enveloped by bright colors and happy patterns, you can’t help but feel cheerful as you walk through the town center. Appenzeller Cheese – regional cheese with a distinctly bold taste. Rösti – hash browns. You can order Rösti with eggs, Appenzeller cheese (recommended), and bacon. 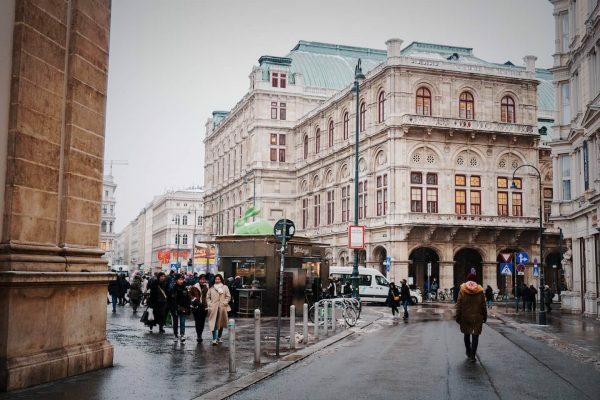 Read our latest post about Europe Travel!